As a transiting exoplanet tracks across its star it progressively blocks out different regions of the face of the star. Since the star will be rotating, one limb of the star will be moving towards us (and so its light will be blueshifted) while the other limb recedes (producing a redshift). The blocking of light by the planet thus changes the spectral lines from the star. This is called the Rossiter–McLaughlin effect, and it can be used to discern the track of the planet’s orbit. Brett Addison and Jonti Horner have written a nice introduction to such techniques on the widely read The Conversation website. 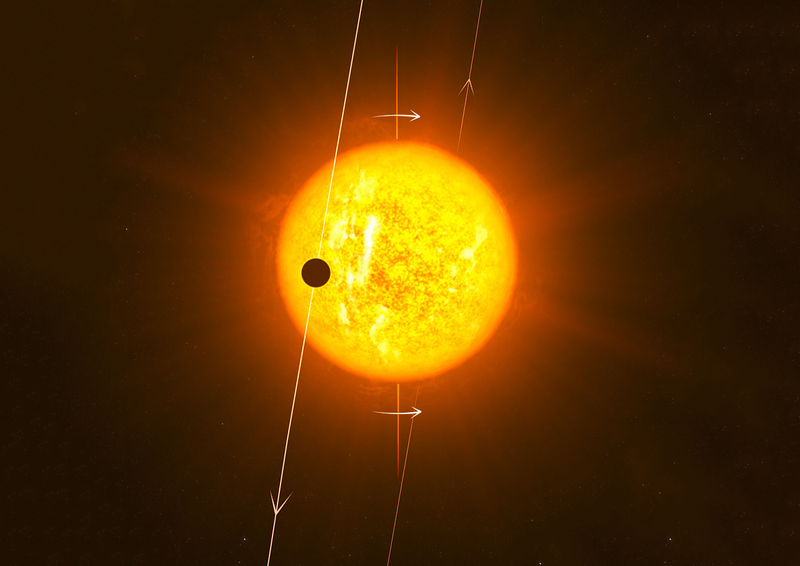 Since large numbers of WASP planets orbit stars bright enough to enable a detection of the Rossiter–McLaughlin effect, around half of the planets with measured orbits are WASP planets. This entry was posted in Hot Jupiters, WASP planets and tagged Rossiter-McLaughlin effect, WASP-79b on August 15, 2016 by waspplanets.